What kind of Lasers do you use? » What kind of Lasers do you use? Die Cut vs Laser Cut? What’s the difference between these techniques? What’s the most cost effective? What’s the right solution for your application? All very important questions! The answer depends on the shape and materials of your custom label, faceplate, nameplate, or graphic overlay. Die Cutting uses a stamping method to cut multiple pieces at one time. The design is usually fairly simple, such as a rectangle with rounded edges. An important consideration is that die cutting requires the creation of a steel die. Extremely sharp, dies can last for thousands of impressions before needing to be replaced. Here at NFI Corp., we have an exceptional library of dies in a wide variety of shape and sizes. We can also create custom dies to meet your specifications for shapes, cutouts, and holes. Standard cutting tolerances are +/- .010″. Laser Cutting offers the ability to cut virtually any pattern imaginable with incredible accuracy – intricate shapes and custom sizes that would be impossible to achieve using a steel die. 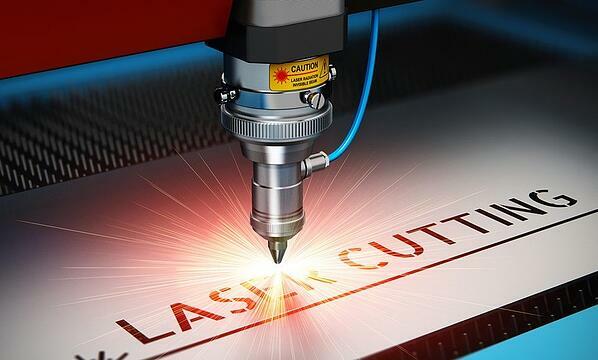 Optically registered, high-speed Laser Cutting offers fine precision for close-proximity cutouts, such as spacer guides. Here at NFI Corp., our state-of-the-art Laser Cutting equipment creates intricate designs and windows for customers’ dials, scales, faceplates, graphic overlays, backplates, plastic cards tags, templates, insulators, shielding, spacers, shims, and gaskets. Laser Cutting is ideal for prototypes and short runs since each piece is cut individually. Typical tolerances are +/-.005″. Learning about different solutions means you can make better decisions for your project. That’s why we’ve created this at-a-glance “Die Cut vs. Laser Cut Comparison Chart” for you. Do you have a project that needs a Die Cut or Laser Cut? Click below to request FREE SAMPLES of recent NFI Corp projects.